A storied train rushes toward a date with death. Jill McLeod is a Zephyrette, the only female member of the crew on the famous California Zephyr, which runs from Chicago to California in the early 1950s. Her duties involve smoothing the way for passengers, administering light first aid, and dispensing information about the stunning scenery only train riders or serious hikers ever get to see. As the train makes its way west this time, Jill slowly gets to know the current crop of passengers, some making short journeys, others traveling all the way to Oakland. Some are pleasant, like Miss Brandon, an Englishwoman who adores Agatha Christie, and others obnoxious, like Mr. Fontana, a businessman who uses his large compartment for high-stakes poker games. The observant Jill is sure that some of them are hiding secrets that are none of her business unless they affect the operation of the train. Jill is pleasantly surprised that her uncle Sean Cleary, a retired Denver police officer, is on the train but a bit worried because his son, Doug, who’s estranged from his father, is also along for the ride. She’s taken aback by the casual racism travelers display toward the largely black train staff but bites her tongue because the passenger is king. Her cousin Doug antagonizes Mr. Fontana both by winning a large sum from him at the poker table and by showing his attraction to a lovely Southern belle who’s fighting off unwanted attention from the businessman. Undaunted, Jill soldiers on, making life pleasant for the passengers, until a murderer strikes. 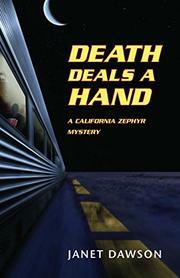 Then she uses her skills as an observer (Death Rides the Zephyr, 2013) to help solve the crime. Dawson creates a charming and intelligent heroine, but the mystery is almost an afterthought to the atmospheric descriptions of this chapter in the 21-year reign of the Zephyr, whose famous Vista-Dome cars delighted passengers with unparalleled views.